The one month extension to the constitutional timeframe for the holding of the 2006 elections has been the subject of much debate and I hope that it is now clear to all that the extension was made in accordance with the Constitution, the Representation of the People Act and the Election Laws (Amendment) Act. Another election to which reference is often made to prove that the results were infected by fraud was in respect of 1997. That election was the subject of an election petition case, known as the Esther Perreira case, and featuring some of the top lawyers of the day including Rex McKay, Keith Massiah, Miles Fitzpatrick, Doodnauth Singh and Ralph Ramkarran. It is important that any distortion or allegation of fraud is addressed by reference to the facts and perhaps helpful for all of us to reflect on other instances in which real electoral fraud took place. We recall that following street protests led by the PNCR, CARICOM stepped in and as part of the fact-finding process, Cross J. undertook a painstaking audit of the counts of the votes of the general and regional elections. The Commission found no evidence of fraud. That the elections were not conducted in accordance with the provisions of the Representation of the People Act and with Articles 59 and 159 of the Constitution of Guyana. Justice Singh cited the legendary jurist Lord Denning who, in a decision in an English election petition case, stated the legal position in such matters to be that if the election was conducted so badly that it was not substantially in accordance with the law, the election is vitiated, irrespective of whether the result was affected or not (emphasis added). In Esther Perreira, the elections were vitiated on technical grounds, not on the voting or the results themselves. Hopefully, this should put the 1997 election results in their accurate, factual and legal context, as was the one-month extension of the constitutionally mandated period between elections in 2006. Now let us turn to the four elections held under a PNC controlled Elections Commission. These were held in 1968, 1973, 1980 and 1985 which were followed by elections in 1992 under the Carter-Price Elections Commission Model. It would be noted that both the 1980 and the 1992 elections were held beyond the normal in two instances, a feat made possible by packing the National Assembly through those very fraudulent elections and having them vote to extend the lives of the Parliament. In the Table below, I set out the votes earned by the various derivatives of the two major contesting parties from 1961 to 2015 which is before and beyond the period the PNC and its successor PNCR – controlled the Elections Commission and, by extension the elections. Magically, once Burnham had muscled out D’Aguiar from the Coalition Government of 1964, according to a UK Granada TV Documentary made of the 1968 elections, he transformed the elections landscape in which, horses, dead persons and Jamaicans cast votes. As the Table shows, the votes for the PPP declined from 113,991 in 1968 to 45,926 in 1985. 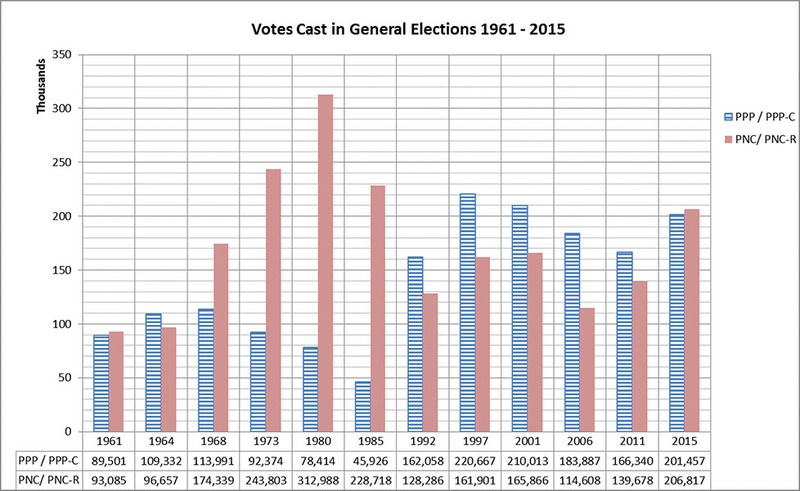 And equally dramatically, the PNC votes increased from 96,657 in 1964 to 312,988 in 1985! For many, the memories of those elections are still fresh while for all, the scars are still there. Not surprisingly therefore, these feed the suspicion that President Granger selected James Patterson as Chairman of the Commission in violation of Article 111 of the Constitution with a view to securing the kind of results the PNC secured between 1968 and 1985. Those who would have us believe that President Granger is this democracy loving, Constitution respecting, separation of power subscribing gentleman need reminding that he is still to give reasons for the rejection of not one, not two but three lists of nominees for the appointment of a fit and proper Chairman of GECOM as ruled by the Chief Justice. Many of us were duped into trusting Granger as an honourable man and that the AFC which I helped to co-found, would be a foil to any excesses or improper conduct. For now however, we are faced with a regime created not out of fraudulent elections but one which is illegal and unconstitutional, having abrogated an important part of the Constitution. At this stage, the discussion about the No Confidence Motion or the right to approach the Court is irrelevant. The Constitution is being brazenly violated and that is all that matters.